So I took my bits to the anodisers and asked what they could do, I originally wanted half of them done a really deep gold colour. This turned out to be not possible (well at least for them) as the parts are stainless steel and they turned out a wishy washy iridescent goldy bluey. This looked rubbish so they turned them back to silver, the black parts looked really good again with a slight bluey sheen to them which doesn’t really show up in my pics. I can interchange these parts now so that I can have the opposite look too, but I preferred this look. The bracelet and case have been repainted in matte black as I could not find local powder coaters that were putting through a batch of matte, I’m really pleased how this has turned out. Rattle cans of Halfords grey primer 2no coats (actually looked great when grey), Halfords matte black 3no coats around £14ish. Held around 12" away and very lightly sprayed, hung over my heater in my shed and around a weeks worth of heat on top of my boiler. Not too sure how long it will be before it chips but I can repeat this again if needs be. It's all technical stuff you know. Phil, that looks nice. So basically you spray painted the plates... how did you cover the jewels? 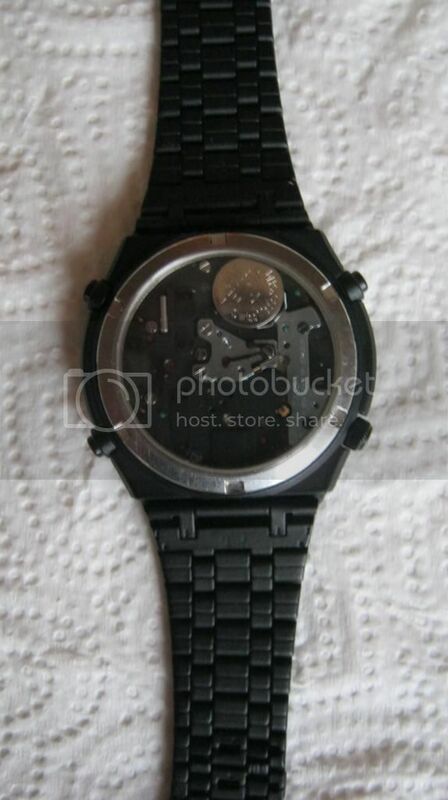 Though it still begs the question what precautions he took (or not) about the jewels in the chronograph centre seconds bridge. So I took my bits to the anodisers and asked what they could do, I originally wanted half of them done a really deep gold colour. This turned out to be not possible (well at least for them) as the parts are stainless steel and they turned out a wishy washy iridescent goldy bluey. 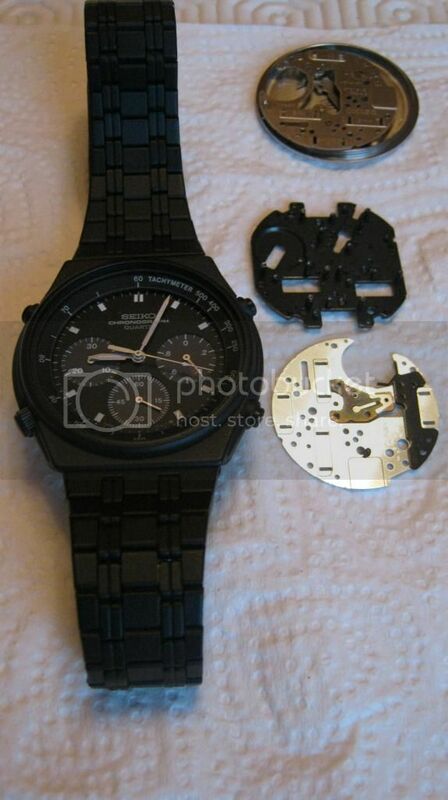 I'd been thinking about using mostly 'off-the shelf' Seiko parts to do it, rather than attempting to have standard parts anodized gold. 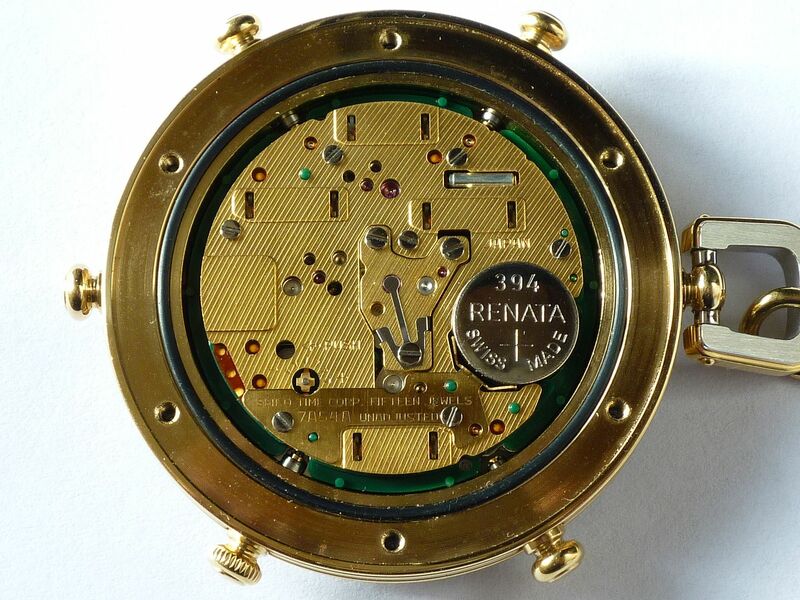 There is an ideal potential 'donor' candidate in the the Seiko Lassale 7A54-7009 pocket watch (which doesn't have a display back). 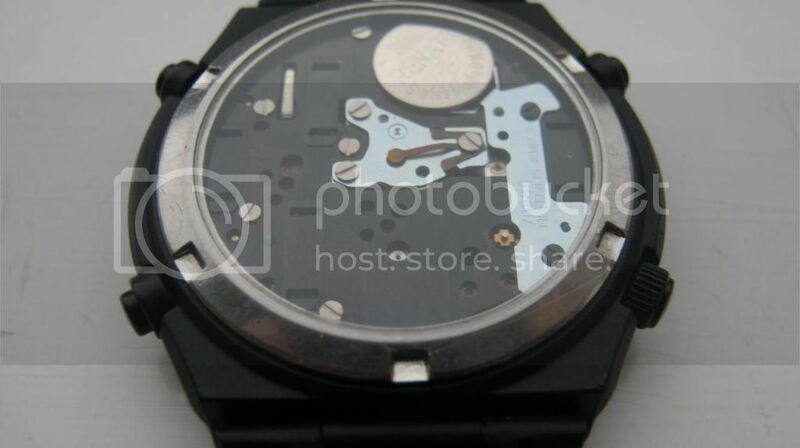 The back-plate is refreshingly free of stampings, compared to most Seiko 7Axx movements, with merely 'JAPAN' and '<-PUSH'. 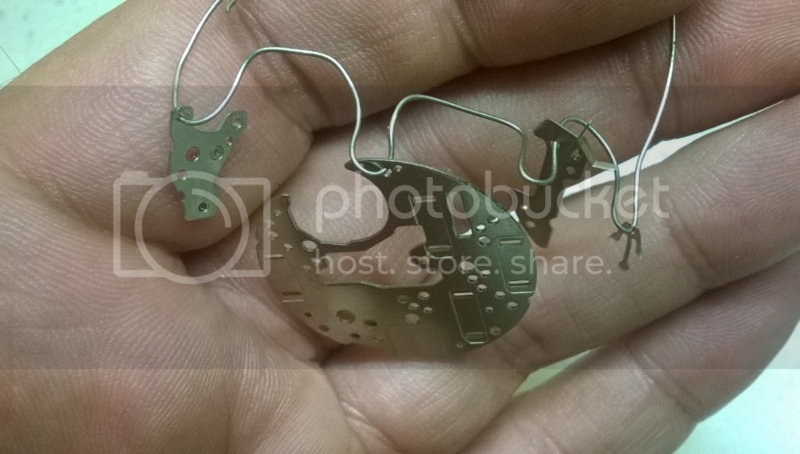 The bulk of the stampings are carried by the battery positive plate. 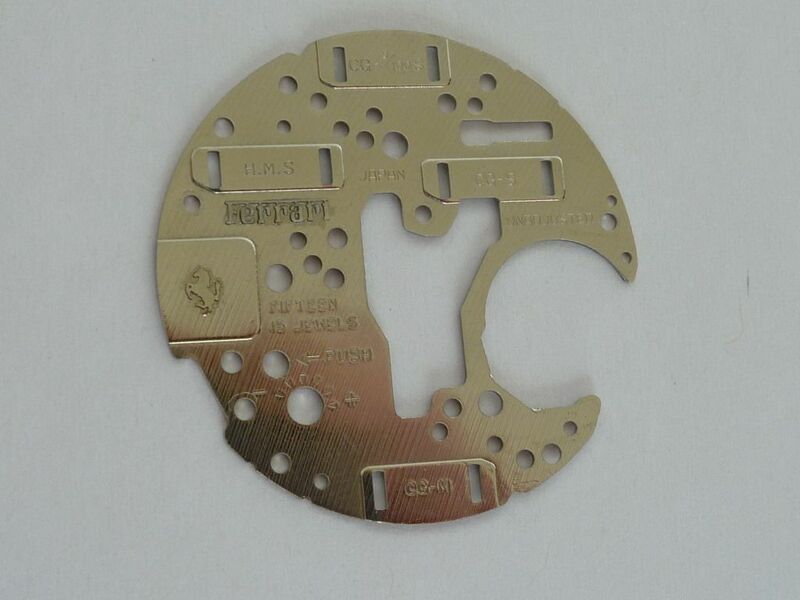 Instead of this, one could use a blank battery positive plate such as found on the Shimauchi V906 movement - and just have that part gold plated (it's copper alloy so should plate easily). Thing is, although I have two Lassale 7A54-7009 pocket watches, I'm reluctant to 'cannibalize' either of them - even by swapping their plates for 'plain' stainless ones - even though nobody but me would actually know. So I went looking for the spare parts. To save you looking them up, the 7A54A movement's gold anodized centre seconds chrono' bridge is p/n 0190728 (stainless is 0190725) and the gold back-plate is p/n 4259728 (stainless is 4259725). Unfortunately both are now obsolete and NLA - unobtanium. But I have another idea. How about anodizing this (or another one like it) candy / metallic red with black Ferrari and Prancing Horse ? The jewels in the bridge were a hope and pray and thankfully were not affected by the acid cleaning or the anodizing process. 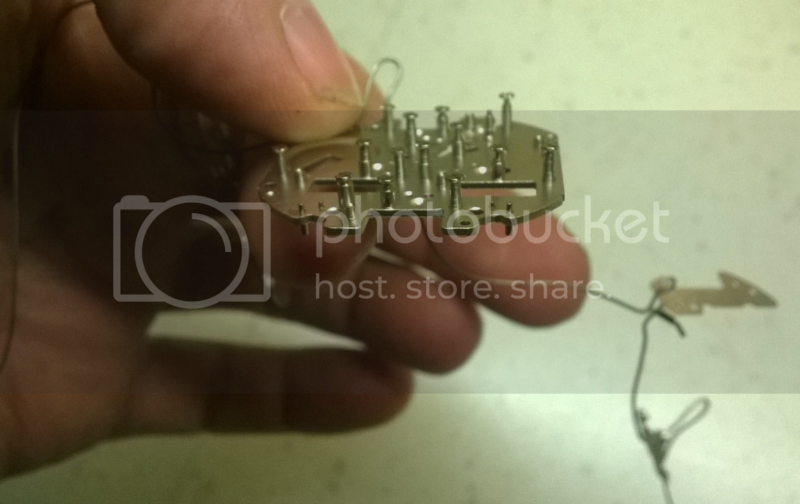 Problem with spray painting a back-plate (and I've got some nice 'clear' red lacquer I could use) is that firstly the back-plate acts a part of the 'earthing' circuit for the switch levers, etc., so functionality might be impaired. Plus tightening the screws the required amount, unless you're very careful, is going to chew up the paint around them. No I think anodizing has got to be the way to do it properly. Aeroquip use red (and blue) anodized stainless steel fittings on their braided hose connections, so somebody must do it. I'm not sure about 'anodising' stainless steel (the process normally refers to aluminium), but I'd be slightly careful with anodising an earthing component - I'm not sure what the drop in electrical conductivity will do to its performance. 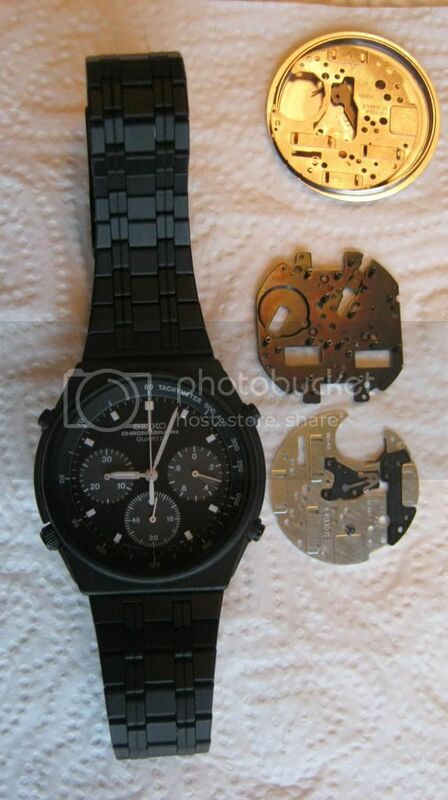 The description of the gold / blue colour, and then being changed to black sounds a lot more like a passivated zinc coating - which is a common process, and I believe is the same as used on black Seiko 7Ax8 cases (which were black chrome; the non-ROHS compliant version of this process). I'm by no means an expert on plating, but hopefully that's remotely accurate and useful! Thanks Ross, I wanted originally half of my bits a gold colour but they turned out not to good so they then changed them back to silver colour the black parts have a blue tinge to them in a certain light. I think I am generalising by using the term anodising and I think you are right with the zinc passivate, I should have paid more attention at the platers. From what I can gather is that to get decent colours on stainless you would first have to aluminium coat them and then any colour can be achieved. We could do with an expert to clarify what we would need to do I think. I am sure Paul will get the answers for us. I'm happy with my black back plate as it is a good match for the case, I have observed no difference with performance yet.